We have had over 35 volunteers chant a portion of Torah and over 46 individuals chant a haftarah. We have numerous capable tefila leaders who volunteer to conduct services. Torah with Laura is a forum for rehearsal and practice to chant (lein) Torah, haftarah, megilla, and lead tefila. We will also offer “Gabbai College” again this year–a one-session class on the basics of Torah service choreography. Sessions are scheduled on most Sunday mornings at 10:30 most weeks from September through June in the TBEMC chapel. The format is drop-in, first-come, first served. We follow the Religious School calendar. In the summer and throughout the year, Torah with Laura is available by appointment; telephone practice is available. 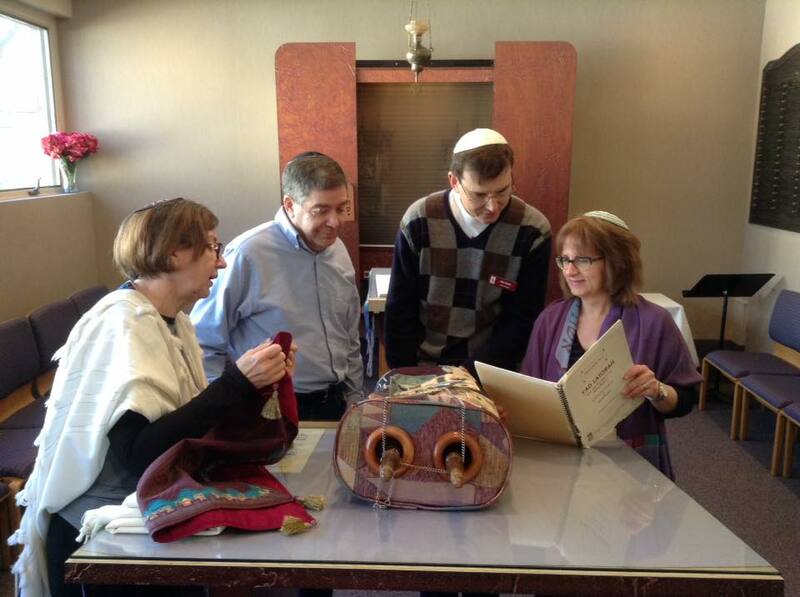 For upcoming Torah chanters and b’nei mitzvah, Torah with Laura is an opportunity to practice “hands-on” with the actual Torah scroll to experience the feeling with the scroll that is used in the prayer service. If you would like to chant an aliya of Torah at an upcoming service, call Laura to get your assignment. We offer apps, recordings, and links to websites to help practice on your own. Torah readers can benefit from having a tikkun, which is an aid to Torah chanting study containing the Torah text and script, side-by-side with the text containing trope notes and vowels. We recommend getting the Pocket Torah app –a tikkun that sings the entire Torah–for iPhones and Androids. Have you been thinking about learning to chant the Torah? Here is your opportunity to learn how! Here is your opportunity to study and practice with the goal of chanting a short aliya of Torah on a Shabbat morning. Class will take place on Sunday mornings 11:00 -12:00 at TBEMC for 8 weeks if sufficient learners are interested–date to be announced. Prerequisite: You should be able to read Hebrew at a basic level. You should be able to carry a tune but ability to read musical notation is not required. Fee: $18 per person to be donated to the TBEMC Minyan Tzedakah Fund. This course is open to members and non-members. B’nei mitzvah candidates will have lessons separate from this course.